Direct Salon Supplies Boxta Hydraulic Styling Chair. 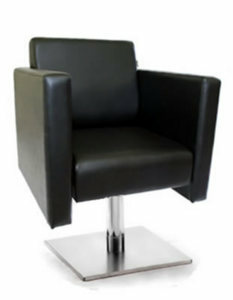 Stylish chair on hydraulic square base available in black or brown (please use drop down box to choose), air gap around seat for loose hair to fall through, comes with 5 year warranty on hydraulics. Fitted chair back cover as standard, rust proof base, hydraulic adjustment with a foot pedal to adjust and lower the height of the chair. Seat height 19" to 24". Please click on picture for more images.